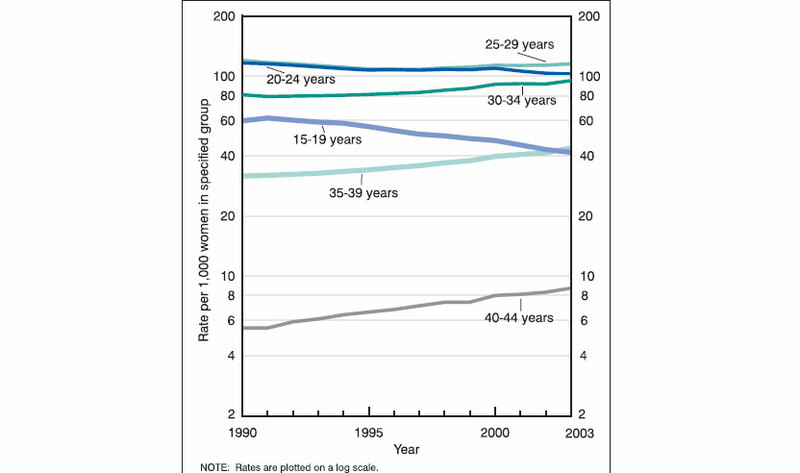 The birth rate for women aged 20–24 years declined to 102.6 births per 1,000 women in 2003, the lowest rate on record. 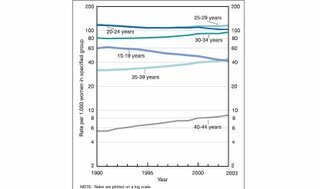 At the same time births increased among the non-Hispanic white, Hispanic, American Indian, and Asian or Pacific Islander (API) female population but decreased among non-Hispanic black women. This change in the number of births in the 20-24 population is consistent with a variety of explanations, but undoubtedly one part of the picture is an ongoing birth postponement process among the US non-Hispanic black population and possibly the initiation of one among sections of the Hispanic population. This is really only conjecture on my part, as I don't yet have data to back this up at all. The pattern of most births occuring early in a woman's reproductive years is historically rather odd. Traditionally, in Western societies, marriage occured fairly late -- mid-20's was typical -- and then births continued to menopause or other source of infertility. "hi.I'm studing demography in tehran university"
Nice to hear from you. Glad you are enjoying the blog. If you have any info, or links, about Iranian demography - or want to send me anything to include in a post - I would be every happy to hear from you. I'm not Ali, but the statistical centre of Iran can be found at http://www.sci.org.ir/english/default.htm. I looked at fertility rates (because I read that the Iranian families in the Netherlands are closest to the average Dutch family in number of kids and (high) age of first mothers) but unfortunately they only seem to have regional overviews. "but the statistical centre of Iran can be found at...."
OK, thanks for this. As chance would have it I have been updating the sidebar this afternoon, and putting in a lot more statistical references, so I have included Iran. As you suggest it isn't particularly useful. Indeed it is really interesting as you surf around to see how much you can learn about a country and the progress it is making by the way it presents (and the effectivity with which it presents) its statistics to the outside world. Try comparing Czechia with Portugal or Greece, for eg. "I read that the Iranian families in the Netherlands are closest to the average Dutch family in number of kids"
This could quite well be the case. Iran is definitely now below replacement, and probbably falling rapidly (in this sense the difference with Iraq couldn't be greater). It is hard to predict the short term evolution of migrant fertility. Mexicans newly arriving in the US currently have higher fertility than they have before they leave. It is really hard to intrepret this kind of data, or foresee its evolution. Some suggest, of course that this can be to get citizenship for the newborn child, and thus give more security to the mother. Iranians arriving in the Netherlands may feel more secure in the short term and advance births, but I imagine their longer term fertility will couple with the native born population. I agree with you about statistics and information - the differences between countries can be hugh. The Iranian/Dutch family comparison I remember because a lot of people tend to associate muslims with high fertility so I thought it amuzing that of all the groups of foreign-rooted people in the Netherlands the Iranian women ressembles the Dutch women closest. Which made me wonder wether the figures in Iran are very different. Especially since one of the major differences between the women from Iran and women from other immigrant-countries is the higher educational level of the Iranian women (even slightly higher than that of Dutch women). "a lot of people tend to associate muslims with high fertility"
Yes, I suppose like people used to associate Catholics with high fertility. (Actually this is just a blind shot in the dark, but I feel that even in Latin America the highest levels of fertility - among indigenous populations - may be precisely in groups where new evangelism is making the greatest inroads). Essentially I think the connections between religious belief and fertility are greatly over-played, and often, obviously simply spurious. Sryia Iyer did some work on fertility in India, and was not able to identify any significant religious connection (methinks I will now do a post on this). Clearer in the case of adherents to strict religous sects - like the Hutterites - you get an effect, but these are very minority cases, and you need to look at how the levels of belief change across generations. On islam, what you say may be true in Europe, but as we can see from comments on this blog and on Afoe, many people in the US point to the dranatic drop in fertility in some muslim countries. As SM Stirling points out elsewhere in comments, Mahgrebi and Middle Eastern TFR's continue to fall fairly quickly Algeria down from 1.92 to 1.89, Iran from 1.82 to 1.8, Morocco from 2.74 to 2.68, Jordan from 2.7 to 2.63, Lebanon from 1.92 to 1.9. Turks (as opposed to Kurds) now have below replacement fertility, and as you point out, so does Iran. OTOH some muslim countries like Iraq, Afghanistan or Saudi Arabia still have very high levels of fertility. "OTOH some muslim countries like Iraq, Afghanistan or Saudi Arabia still have very high levels of fertility." -- this is true except that you've got the wrong countries. Yemen (6.58) and Afghanistan(6.68) are _high_, but even there there's been a decline from _very_ high (over 7). Saudi Arabia is now down to 4 and Iraq to 4.18, both showing significant declines in the last few years. "Saudi Arabia is now down to 4 and Iraq to 4.18, both showing significant declines in the last few years." Look I hate to be a pedant here, and it isn't that I have anything generally against their fact book, indeed quite the contrary I think it is most useful, but we do seem to be coming up with a lot of discrepancies here. As far as I can see the PRB is a reliable reference point for data, and I think it more prudent to refer to them when there are discrepancies. Now for Iraq you suggest that the TFR in 2006 is 4.14. Well in 2005 it was 5.1. We will have the 2006 data in the summer, and it will of course be interesting to compare. Similarly with SA, it was at 4.5 last year, and I seriously doubt that it has fallen so quickly, but we will se when the data is out.
" -- this is true except that you've got the wrong countries." OK I accept and rephrase: Afghanistan has very high fertility, and Iraq and SA have relatively high fertility. If I had just said 'high, I would of course have been fine. Well, I'm a medical student and have a background in public health. Americans are generally irresponsible about sexual education (particularly birth control and prophylaxis such as condoms) and that explains their high teenage pregnancy rates. According to The Economist this year, the teenage pregnancy rate in the United States is 600 times higher than Holland. That's nothing to be proud about. I think this can primarily be explained by the conservo-fascist social norms of our culture, where it's so inappropriate to go out and buy condoms or get on birth control, phenomenon which are much more common in more socially aware and liberal countries like Japan, Holland, France and UK.